In 1668, the pharmacist Friedrich Jacob Merck laid the cornerstone for what Merck is today – a vibrant, global science and technology company. “350 years, that’s an incredible number, especially if you consider everything that has happened in the world of science between 1668 and today. We are proud of the many contributions Merck has made to research and development. And we will also continue to do exactly the same. In other words, we are infinitely curious about what is coming,” said Stefan Oschmann, Executive Board Chairman and CEO of Merck. A highlight of the anniversary year will be the “Curious2018 – Future Insight” conference in Darmstadt in mid-July 2018. This will be attended by more than 35 renowned international scientists – including five Nobel Prize laureates – who on three days will be presenting their work and discussing the future of science and technology. Merck is supporting this premiere event as the main sponsor. The speakers will present to an audience of around 1,000 guests from all over the world topics oriented to the main focal areas of the three Merck business sectors (Healthcare “Healthy Lives – new breakthrough therapies and diagnostics”, Life Science “Life Reimagined – synthetic biology and beyond”, and Performance Materials “Materials & Solutions – chemistry and beyond”). Other topics of the conference address questions regarding digitalization (“Vibrant Digital – the power of in silico”) and new forms of collaboration (“Bright Future – new ways of working and collaborating”). “We are fighting cancer and other serious diseases. We are helping other companies to conduct research even more quickly and efficiently. And we are developing high-tech materials with which autonomous driving or foldable displays, for example, are becoming reality. We are doing all this in close partnership with top researchers around the globe. Therefore, we are very much looking forward to a huge celebration of research with the best of the best,” said Stefan Oschmann. Besides the five Nobel Prize-winning scientists – Joachim Frank (2017, Chemistry), Fraser Stoddart (2016, Chemistry), Bruce Beutler (2011, Medicine), Harald zur Hausen (2008, Medicine), Jean-Marie Lehn (1987, Chemistry) – further renowned representatives of the scientific and business communities, among others, will be present at “Curious2018 – Future Insight” (see agenda here). Another central event in Merck’s anniversary year is the European ceremony on May 3, 2018 in a pavilion especially constructed for the celebrations. Around 900 guests from the worlds of politics and business are invited to this event in Darmstadt. Further regional ceremonies will take place in June in Shanghai, China and in October in Boston, USA. In addition, as part of the European ceremony on May 3, the new Innovation Center will be officially opened. The newly designed and constructed building at the heart of Merck headquarters offers start-ups and company-internal innovation teams a five times larger area than was formerly available for working on innovation projects outside the existing business. “It is a great joy to collaborate with young entrepreneurs. And who knows, one of the promoted business ideas might evolve some time into a company like Merck. After all, we also began as a start-up in 1668,” said Stefan Oschmann. 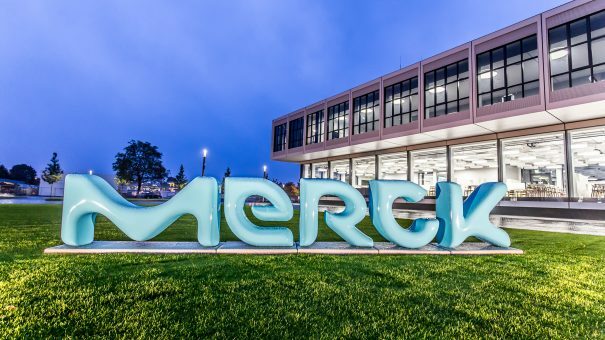 Before Merck celebrates with external customers, partners and representatives of society, a celebration for employees will take place on April 18/19. This is planned for the around 50,000 people working at Merck worldwide and will extend over all continents for 24 hours. “The celebration is a huge expression of our thanks to all our employees worldwide. With their work day by day, they ensure the success of our company. In Darmstadt we have many employees whose families have worked loyally for Merck over generations, which we highly esteem. Yet more and more talented people join Merck from all over the world, because they feel that Merck is a place where exciting things can be made to happen. In April, together with all of them, we will celebrate 350 years and the future,” said Stefan Oschmann. The other numerous events marking the 350th anniversary of Merck include the national “Jugend forscht” (Young Researchers) competition under the auspices of German Federal President Frank-Walter Steinmeier, which will take place in Darmstadt from May 24 to 27. The “Federal President’s Award for Outstanding Work” is among the prestigious prizes awarded at the German national finals. A highlight towards the end of the anniversary celebrations in autumn will be an Open Day on September 22, 2018 at global headquarters in Darmstadt. Interested visitors will then have the opportunity to take a look behind the scenes of the science and technology company Merck.